It’s summer time and glamping season is here! Our Canvas Cabins and Canvas Cottages have been spruced up after the long winter, comfy beds are freshly made and are waiting for your arrival. Our new Yurt village is getting its final touches right now – we’re installing furniture this upcoming week in anticipation of our June 15 opening date! 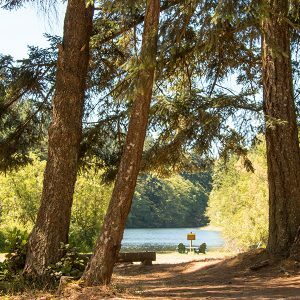 So we thought this would be a great time to give you our 7 reasons why glamping in the Pacific Northwest is probably the most legal fun you can possibly have this summer. 1. If I had to give you just one, and only one reason (instead of the 7 that we’re advertising), it would have to be getting an impossibly good night’s sleep in the great outdoors. Think pillow-top mattress covered with a cozy flannel duvet-cover and the sounds of frogs croaking outside your screened door. And maybe the best part of all is no tent set-up, no pumping up that air mattress, and no musty old sleeping bag to have to crawl into. Sheer bliss. 2. Wherever you glamp in the Pacific Northwest, you’re bound to find some pretty amazing scenery and awe inspiring surroundings. Some glampsites will have lakes or forests (like ours), some mountain views, and some glimpses of the ocean, but half the fun of glamping is waking up and going to sleep with a different vista than your normal one. And the Northwest and San Juan Islands have more than their share of views to enthrall you. 3. There are a few factors that give the Northwest it’s lush, green, verdant beauty – yes, we do get some rain. 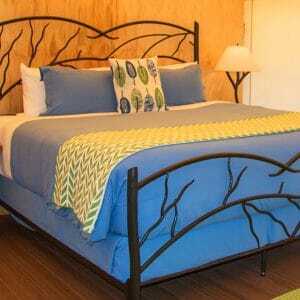 Hence another great reason to glamp – shelter from the storm! Imagine waking up with the pitter-patter of rain atop your Canvas Cottage, knowing you can spend the day inside with your favorite folks, playing gin rummy or a board game, or just sleeping the day away – without being drenched. All the rain and none of the pain. 4. With so much changing in the environment, one of the things we love about glamping is that it’s a very eco-friendly way to travel. With a smaller footprint on the land, no massive resort complex required to support the lodging, and simpler forms of heating and electricity than a typical hotel room, glamping immerses you in a low-impact nature experience, while also protecting good old Mother Earth. 5. Everybody has a budget, whether large or small, and another advantage of going glamping is that there is a glamorous camping experience for every budget along with all the bells and whistles to match. From a basic camping set-up (ours is called Camp E-Z and includes a tent, canopy, 2 camp chairs, and 2 cots, all set up at a campsite for you, and for only $45/night on top of your campsite fee) to glamping units with no bathrooms, tents with full private bathrooms, yurts with hot tubs, tree-houses, or luxury glamping resorts with personal concierges, massages, and expeditions included. Go low or go high, whatever you can afford! 6. Is there anything better than a campfire? that smoky smell (and having it in your hair the next day)? the crackling flames of the fire sparkling into the dark night? 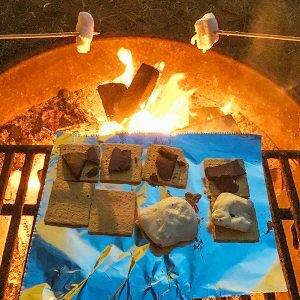 The ooey-gooeyness of marshmallows after you’ve cooked them and made a s’more or five? Campfires and singing and cook-outs – all part of glamping life! 7. And last, but not least, at Lakedale anyway, the delicious arrival of Toasty Toes! Every night, when you stay in our Canvas Cabins or Cottages, we deliver fleece-covered hot water bottles for you to place in the bottom of your (plush, pillow-topped) bed to keep your toes warm all night long. Sweet glamping dreams, everyone! Furry Friends and Feathered Fun!